So much has been happening in this campaign over the last few days, that I've been having a hard time keeping up with my own reading, let alone writing. Add to that such other little things as family, work, and the holidays, and I'm lucky to be keeping my head above water. With that in mind, I wanted to try to reference a few of the more interesting bits and pieces that I've come across in the last few days. With any luck, this weekend, I'll be able to spend a bit more time writing about the frightening turn that the campaign has taken in the last week or so. OBAMA: But I do believe that we have to change our policies with Pakistan. We can't coddle, as we did, a dictator, give him billions of dollars and then he's making peace treaties with the Taliban and militants. What I've said is we're going to encourage democracy in Pakistan, expand our nonmilitary aid to Pakistan so that they have more of a stake in working with us, but insisting that they go after these militants. And if we have Osama bin Laden in our sights and the Pakistani government is unable or unwilling to take them out, then I think that we have to act and we will take them out. We will kill bin Laden; we will crush Al Qaeda. That has to be our biggest national security priority. McCAIN: Sen. Obama likes to talk loudly. In fact, he said he wants to announce that he's going to attack Pakistan. Remarkable. You know, if you are a country and you're trying to gain the support of another country, then you want to do everything you can that they would act in a cooperative fashion. OBAMA: I want to be very clear about what I said. Nobody called for the invasion of Pakistan. Sen. McCain continues to repeat this. What I said was the same thing that the audience here today heard me say, which is, if Pakistan is unable or unwilling to hunt down bin Laden and take him out, then we should. (Emphasis added.) What I found remarkable about this exchange is that Sen. McCain was willing to misquote Sen. Obama to his face. It is one thing to take your opponent's statements out of context in a stump speech or for an advertisement. But to simply make up a statement out of whole cloth with your opponent standing right next to you? That's just stupid. Worse yet, Sen. McCain tried to lie about Sen. Obama's position mere moments after Sen. Obama stated the position quite clearly. And, it is worth noting that when Sen. Obama reiterated his position, he did, indeed, echo the position as he originally stated it. Perhaps Sen. McCain does not understand the nuances of Sen. Obama's position (not that I find it to be a very nuanced position; if Pakistan won't kill Bin Ladin, we will...); or, perhaps, Sen. McCain just doesn't care about the truth and facts are anymore. Sen. McCain has to make Sen. Obama look dangerous, risky, and unpresidential, and if the only way to do that is to try to create a sound bite that completely misrepresents what his opponents said or stands for, then the truth be damned. The Republican base may like it, but I think other voters can easily see through this kind of cheap shenanigan for what it is and recognize the desperation (not to mention dishonor) in Sen. McCain's conduct. This echoes some of the concerns that I wrote about a few weeks ago in my essay "Elitism in Politics". It's nice to see that some on the right are growing concerned with the rights's disdain for intellectualism. Next, I found this video to be rather interesting. 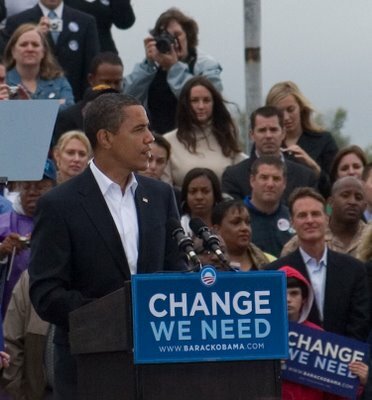 It intersperses parts of a speech that Sen. Obama gave back in July 2008 with current statements and advertisements from the McCain campaign. 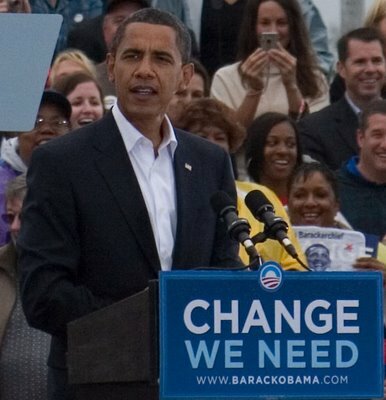 It looks like Sen. Obama had a pretty good sense of the strategy that the McCain campaign intended. Attending a campaign rally is cool; attending a campaign rally for a Presidential candidate in the general election is really coo. Attending a campaign rally for a Presidential candidate in the general election the day after a debate in a state that could flip from red to blue for the first time in my lifetime. Priceless!